The Carbon Bar to Rule Them All? Looks to kill, Great attention to detail, Super light weight, Multiple color options, Overall great bar. The first thing I noticed was the looks. Boy this thing looks killer. The curves are smooth and the graphics are spot on. Available in 5 colors (black, red, green, blue, and orange) I chose to green decals in hopes it would match my Gambler 720. When putting the bars next to the paint job, it wasn’t exactly the same color green but it matched close enough. What it lacked in matching my frame’s paintjob, it made up in attention to detail. The SixC bars also come with a nice matte clear coat finish that hides scratches quite well. Another really nice detail Raceface included with this bar can be found at the bar ends. Once a bar is installed, the majority of riders ride them as is. For the out of the norm rider, who knows exactly what wide they want, Raceface included cutting guides that not only tell you exactly how much you are cutting off, but how much weight you are losing as well. All and all, the SixC is a gorgeous handlebar. PS, They are super light weight! The main reason I chose a 35mm bar is because this new “standard” offers the greatest amount of stiffness to weight ratio. When letting go of the brakes and really giving the Gambler hell, I noticed that these bars are by far the stiffest, most predictable handlebar I have ever owned. The SixC strikes a perfect balance between overall stiffness and flex (small bump sensitivity) so you are still able to feel your hands by the end of a Canadian Open DH run at Whistler. Not being able to ride the bike as much as I used to, having components like a good carbon bar really helps my body hold on for dear life when I’m not exactly conditioned for the season. I also found the sweep of the bars (8° back and 5 ° up) to feel very normal as well. After spending months on this bar, I am glad to say I have been 100% satisfied with its performance. It regards to customization, Raceface made the SixC bar available in 5 colors as mentioned above. Unfortunately, these 5 colors are only available in the 20mm rise option. It would be nice to have all these color options in the full line of SixC bars (10mm and 35mm rise). Aside from that, these bars couldn’t get any better. I purchased the Raceface SixC handlebars because I wanted the stiff 35mm diameter, 800mm length, and color options so I could have my bars match my bike. In addition to getting these things, I got a beautiful matte finish and guidelines on the end of the bars if I need to cut them later on. Coming in 3 rise options and 5 colorways (for the 20mm rise version), Raceface gives you one of the widest options for a DH rated bar in the industry. I have been quite pleased with my SixC bars and would recommend them to anyone! These bars look so much bigger than their 31.6 counterparts. I have been used to the feel and weight of carbon bars. My new bike came with 35mm aluminum bars. I have used 31.6 SIXC bars in the past, so it was natural to give their 35mm bars a shot too. Raceface always has a great finish on their products and these bars follows that pattern. The matte carbon looks great and there are multiple color ways to choose from. The bars are marked if you choose to cut them from their 800mm width. I chose to leave mine the stock width for the time being. I am coming from 760mm bars, the extra room feels good especially with using the double clamp design of Revolution Suspension Grips. I was worried about a harsh characteristic of these larger diameter bars. This thought was quickly put aside as Raceface has found a good balance between stiff and compliance. Handlebars should be a set and forget type of component, these are just that. I do not want to think about different components during my ride. I rode with the full 800mm width to begin with, but I opted to cut them down to 780mm. Once I had my cockpit set-up just how I liked it, they felt at home and off my mind. This is a short term review, but if these bars hold up like my previous SIXC bars, then I have no worries that these will last even longer than my new Spartan. I am struggling to find anything that could be improved other than some more subtle graphics. Raceface has created another go-to product for me. I anticipate these to be trouble free for many years of excellent performance. If you re looking into 35mm bars or your new bike came with them and are looking for a carbon upgrade, stop here. They are among the lightest for their intended purpose. Very nice bars despite the price. Pricey depending on how you look at it. I purchased the SIXC 35 bars as an upgrade to the stock Bontrager bars that came on my Trek Remedy. The Bontrager bars did not fit well and caused my hands to hurt after only a few miles of riding. The bars on my previous bike had a similar shape to the Race Face and I was looking forward to the weight saving and damping characteristics of carbon. 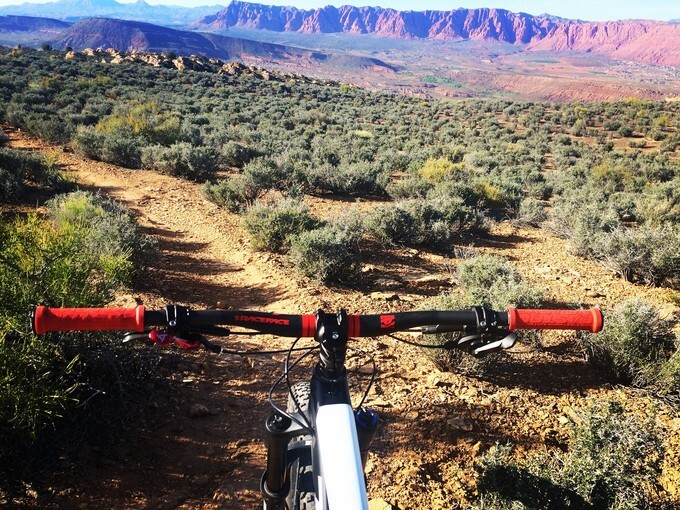 I ordered the bars from Bicycles Unlimited, my LBS here in St. George, UT. When the bars showed up and I picked them up I was immediately impressed with how light the bars were. Just holding them in your hands it hard to imagine something that light being able to hold up to the abuse on a trail bike, let alone a DH bike. The graphics are super sharp and the red color just pops. The black is a nice matte finish that I'm sure will hold up well to the elements and wear and tear. I mounted the bars the stock Bontrager Line stem (with Knock Block) that came on my bike. The bars have cutoff lines if 800 mm is too wide for you (I have left mine so far), and center indicators to help with centering and roll adjustments. The bars torqued down and has remained creak free since. The matte finish seems to grip well and my Easton grips haven't budged. The most important quality I was looking for was fit and shock absorption. The SIXC 35 delivered in both of these categories. My hands immediately felt at home and the chatter is noticeably muted. The bars are stiff in all the right wars and handling was improved. Not that it is overly noticeable on the trail but the new bars did drop a full half pound off the weight of my bike. When you are justifying spending over $150 on a pair of handlebars it can be a bit difficult to make a case, and if the bars that came on my bike did not cause such problems for me would have been an upgrade much lower on the list. But as it sits I'm very happy with the quality of my new bars. The fit finish and ride are all second to none, and the red really does snazzy things up. If you are looking for carbon bars to spice up you riding life I don't think that you can go wrong with these. Your favorite bars just got bigger, wider, and lighter, Go figure? The magic of 35, believe the hype! Increasing the bar diameter to 35 allows us to shave material from the bar resulting in a dramatic reduction in overall weight while retaining the proven stiffness, strength and performance Race Face bars are known for. A wider rise range to perfectly tune your fit. From ultra low 10mm rise to super high 35mm rise - Our lowest and highest rises yet, with the much loved 20mm rise rounding out the 3 rise options. With the full 800mm width (Can be trimmed down to 750mm) for hyperspeed control, can you handle it?